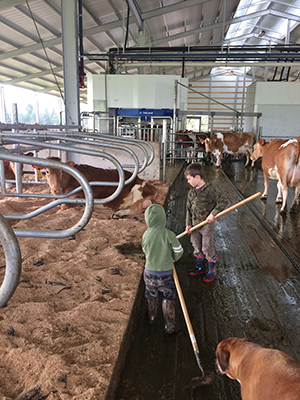 Striking the right balance between chores and fun is the goal for our little farmers. Tomorrow, Little Farmer, our oldest son, “graduates” from kindergarten. We can officially say that we survived the first school year. Truthfully, this season of life, where we have balanced school responsibilities and farm duties, has brought its own set of challenges. We are definitely looking forward to the next two and a half months of freedom. But we are also trying to be mindful of identifying the right balance between summer fun and farm responsibilities. As he is 6 years old, we are really trying to incorporate our Little Farmer in his first summer vacation from school. Attending school was a difficult transition for him as he was away from the farm work. As we look at his full-time return for these summer months, we are trying to engage him in conversations about what chores he would like to take on as his responsibility. Among his list was bottle feeding calves, cleaning the milk cow stalls, help with daily robot cleaning, and halter-breaking one of the bull calves we have awaiting an A.I. contract. It was fun to see what chores he chose on his own. Returning from the school environment, which he loved, to a full day back on the farm is also an adjustment we are trying to keep in mind. We made sure to balance the responsibilities with a list of the fun things he would also like to enjoy this summer. Topping that list is a requested trip to the beach. Also daily activities he has missed like playing with his little brother, time for bike rides, going for adventure walks on the farm property, and a summer favorite of getting the pool out. It is all a balancing act between engaging our kids in farm duties and also remembering they still need some time to let loose during summer vacation. I don’t even pretend to have all the answers, but I’m just trying to find the right combination to keep farm life fun for the few summers we have our kids at home. That’s only 12 more summers for our oldest, not that I am counting or anything. I hope to make them memorable while still successfully finding a balance with dairy farm life.